Explore these great things to see and do in Naha, from white-sand beaches to Shurijo Castle. It’s always crowded, always local, and always fun – Kokusai Dori or International Street is a 1.6km strip in the heart of the city known as the ‘miracle mile’. The biggest race is the Naha Haari, which takes place every May and attracts more than 200,000 visitors. 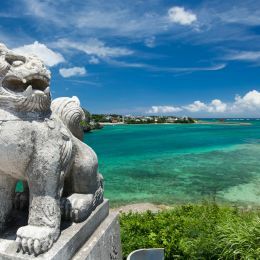 Although many sacred places or ‘utaki’ are found all over Okinawa, Seifa Utaki, tucked away in the rural south-east of the island, is the most revered. Almost a kilometer long, Okuma Beach’s smooth white sand, sparkling waters and colorful beach cottages are picture perfect. Okinawa pottery or ‘yachimun’ has a history of more than 400 years, and is known for its high quality and distinctive style. Busena Cape boasts an luxury resort, a marine park with an underwater observatory, and a beach with a pier offering marine activities, such as glass bottom boats. One of the most famous spots on the island, the Blue Cave draws divers, kayakers and snorkellers who all want to see the stunning sapphire colors hidden inside. Just offshore Kume Island, and surrounded by untouched reefs, is one of Japan’s biggest shoals – a sandy bank almost seven kilometres from east to west. This fish market in the outskirts of Naha sells the freshest catch from the Okinawa Fishing Cooperative, and specializes in local tuna. 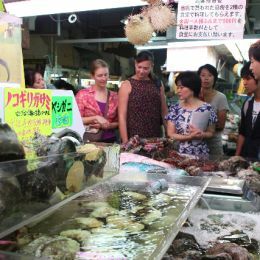 Walk with an empty stomach and a big appetite when you head to Itoman’s Osakana Center, just south of Naha Airport. Tug-of-war events are held all over Okinawa from July to October, and the Naha Great Tug-of-War is one of the biggest. True to its name, Emerald Beach was selected as one of the 55 Best Beaches in Japan by the Environment Agency. In the Okinawan dialect, ‘champuru’ means to mix and combine, and the name is aptly applied to these dishes, which mainly consist of stir-fried vegetables but also ingredients such as pork and shima tofu (island tofu). Loved by locals and made only in Okinawa, Awamori is a true flavor of the islands. With tens of thousands of servings eaten every day, it is no exaggeration to say that Okinawa soba is soul food for the people of Okinawa. This beautiful Chinese garden is a green oasis in downtown Naha, and a symbol of Okinawa’s close ties with China. This may be an artificial bay, but you can have some real fun here at the three different beach sections that play host to year-round activities, like beach volleyball and barbeques. Named after its perfect semicircular shape, Moon Beach is located in popular resort area Onna Village, and though attached to a hotel is open to the public. On the first Sunday of every August, Kokusai Dori (International Street) transforms into a festival zone with the parade of 10,000 Eisa Dancers.